Moving the color tag of the Symbols to the right. I think your idea is more visually noticeable, though I do like the idea of an underline as well. The thing with the underlines is that sometimes is not visible enough, I think. This way, the chances for that to happen are minimal. I like this one but ... why a line if like you said one pixel is sometimes hard to distinguish. A rounded or square would be more visible. And this look like the one from Adobe but much thinner though I like it's gradient color which is inovative. The color label in the right side is more than 1 pixel wide (3 to be exact), and we tend to see vertical lines thicker than horizontal ones. I thought that was enought size and enough contrast. My idea was to match the style already used by Serif. 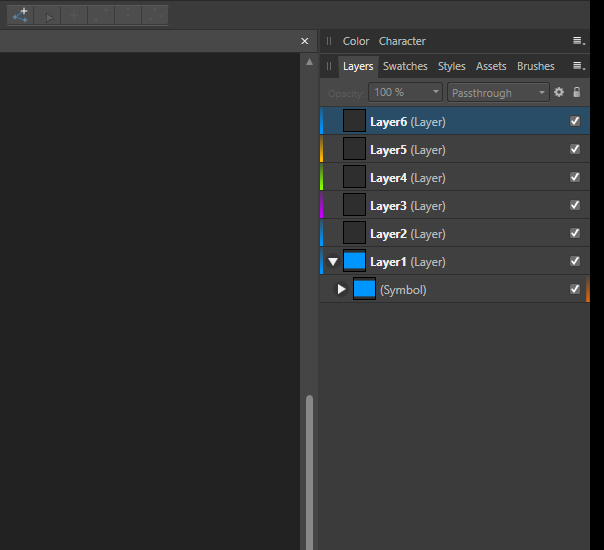 Now, the reason to move the color labels to the left was that most people look from left to right and I guess that Layers are more common thatn Symbols, so the first thig that should be shown is something to identify the Layers.